All my boss does is complain about the Braves’ manager. To shut him up, I proposed a story showing him how lucky he and Atlanta baseball fans actually are. Sorry about your Braves. I’m sure you watched to the bitter end, right? I mean, it was the playoffs, after all. They had it. Up 3–2 on the Dodgers. Game 4. Six outs from tying the series. Then David Carpenter gives up that double to lead off the eighth. Camera cuts to Braves dugout, Fredi Gonzalez chomping on his sunflower seeds. Then a shot of Craig Kimbrel, only the game’s best closer, in the Atlanta bullpen, just waiting for the call. A call that Fredi wouldn’t make. You’re probably screaming, Jesus, Fredi, put in Kimbrel! Instead, Juan Uribe parks Carpenter’s hanging curve in the lot beyond left field. Etc., etc. Braves choke again. I swear I could hear the chant in my neighborhood: Fire Fredi! Fire Fredi! Sorry. Didn’t mean to mock your misery. (Well, maybe a little.) I’m still relatively new to town, not a Braves fan. But I’ve followed baseball most of my life, and I’ve gotta say that some Braves fans seem to have an inflated sense of their own suffering. You’ve had, what, two losing seasons in the past twenty-three? Fifteen division championships? Five pennants? C’mon! And what has Fredi done but continue that success? Since taking over the Braves three years ago, he’s won more games than any manager in major league baseball except the Rangers’ Ron Washington. Fourth-best record in the majors in 2012, second-best in 2013. But you guys still hate him. The sarcastic Twitter handles. The Fire Fredi Facebook page. The whining about his one career playoff win. 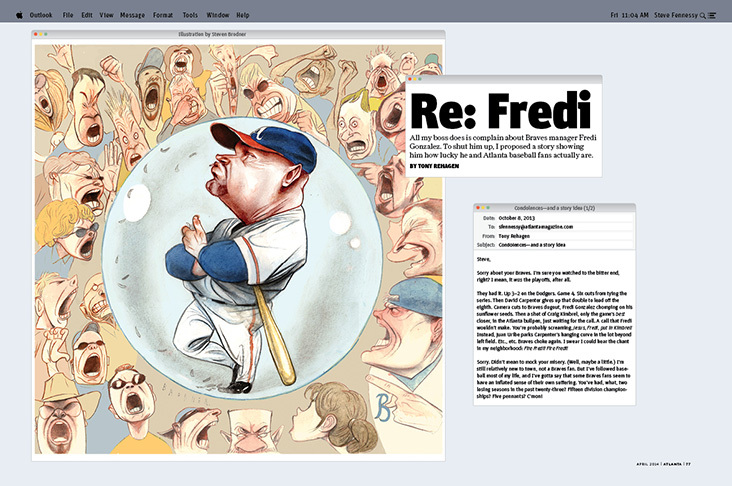 Look: Fredi’s fifty years old, and he’s been a big-league manager a total of seven seasons. In their first seven seasons, Joe Torre, Tony LaRussa, and your own Bobby Cox combined got only one playoff win. Fredi has the sixth-highest career winning percentage among active managers and more wins in his career than Torre, LaRussa, or Cox had at the same point in their careers. Anyway, my story idea: It would be about Fredi—sorta—but would actually be about the baseball fans around here who need to stop complaining and appreciate what they have. Quick follow-up: Any story would have to look at what a baseball manager actually does. Sure, he makes the lineup, shifts the fielders, calls the bullpen. But much of the game is out of his control. Hitters have to hit. Pitchers have to pitch. There’s this sabermetrician, James Click, who studied manager-driven statistics like bunting, intentional walks, and stolen bases. He couldn’t find a single manager who consistently helped his team win more by trying these things. So, this infallible tactician you’re looking for? Sorry, he doesn’t exist. And let’s say we get to July and you’re more tired of Fredi than ever. Firing him won’t work either. Analysts have found that midseason managerial switches have negligible impacts on winning. Maybe you should ask yourself who built the team you have? That would be general manager Frank Wren, using money from Liberty Media. In 2003, when Time Warner still owned the Braves, payroll was $106 million, third-highest in the majors. In 2013 it was $89 million, which ranked sixteenth. News flash: The sixteenth-best team has never made the playoffs. Meaning that Wren has spent the money pretty well—except when he hasn’t. Nearly a third of last year’s payroll went to B.J. Upton (.184) and Dan Uggla (.179), who combined for 322 strikeouts. All Fredi’s team did with the rest of the money was win ninety-six games.